Gash Bell The 1st Movie: Unlisted Demon "#101"
Zatch and Kiyo go on a camping trip in the forest near Mt. Fuji with their friends. When they meet a girl name Ctoha, who found a special book that tells her of things to come, her mother suddenly gets seriously sick. Now, to find a cure (and Zatch's mother), they must go to a cave in the forest. In the cave, Zatch and Kiyo are taken to the mamodo world, while Ctoha takes a strange man named Wiseman to cure her mother. 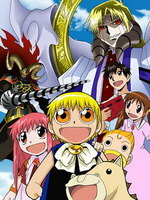 In the mamodo world, Zatch and Kiyo are chased by the Magister Black Knight, who thinks that Zatch has stolen the 101st book, which was to be for the King. Now, Zatch has to clear his name and return to the human world within 24 hours so that he can defeat Wiseman, who is actually a mamodo that stole the 101st book, and save Ctoha from him.